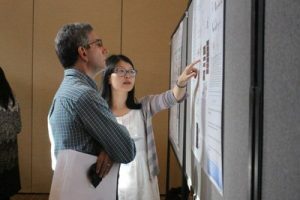 A showcase of the latest research findings of the University of North Carolina Lineberger Comprehensive Cancer Center’s scientists-in-training drew an audience of faculty, staff, students and former postdocs on Tuesday, Sept. 25. The 43rd Annual Postdoc-Faculty Research Day, held at the Carolina Club and sponsored by UNC Lineberger and the Integrated Training in Cancer Model Systems Postdoctoral Training Program, featured talks and poster presentations by cancer center postdoctoral researchers. UNC Lineberger’s Channing Der, PhD, training program director, said the talks were “outstanding,” and displayed the “variety, breadth and depth” of cancer research that is going on across the center. Robert Duronio, PhD, associate dean for research for the UNC School of Medicine and a professor in the UNC School of Medicine Department of Genetics, and Wanjuan Feng, PhD, postdoctoral research associate at UNC Lineberger..
Rebekah Schulz; Mitchell Butler, PhD; Craig Goodwin, PhD; Ryan McNamara, PhD; and Chase Weidmann, PhD. Two former postdocs who are now working at other universities returned to UNC Lineberger to deliver presentations. Christin Burd, PhD, is an assistant professor in the Departments of Molecular Genetics, Cancer Biology and Genetics at The Ohio State University, and was formerly a postdoctoral fellow in the laboratory of Norman Sharpless, MD, who is the director of the National Cancer Institute. Michael Kinch, PhD, now the associate vice chancellor at Washington University at St. Louis and the director of the Center for Research Innovation in Business, was also a postdoctoral fellow at UNC-Chapel Hill. At a reception following the showcase, awards were given for the best presentations and posters. Craig Goodwin, PhD, and Giada Zurlo, PhD, were co-awarded the prize for the top presentation. 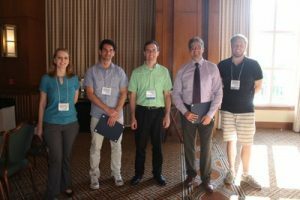 The awards for the top posters among postdoctoral fellows went to Ryan McNamara, PhD, for first place; Chase Weidmann, PhD, for second place; and Mitchell Butler, PhD, for third place. Rebekah Schulz, a graduate research assistant in the UNC School of Medicine Department of Genetics and Molecular Biology, received the award for top poster by a graduate student.